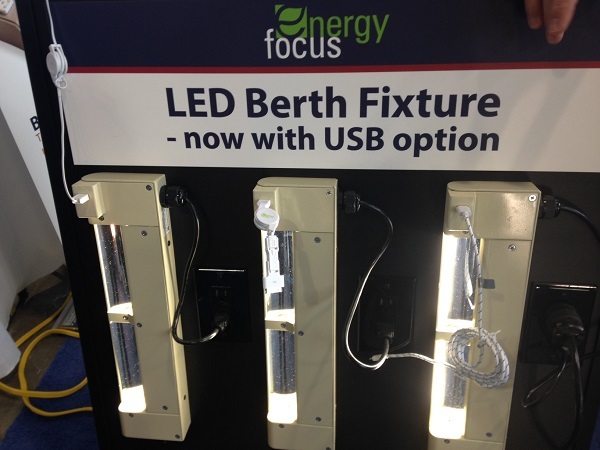 Energy Focus’s LED rack lamp comes with a USB drive, as seen at the 2014 Sea Air Space convention. If you’ve spent any time in an enlisted berth — outside of gilded officer country — then you know it’s kind of a dive. This despite the XO’s best efforts. For sailors, it’s really the little things that matter: A TV that works, working showers, a working berthing iron that isn’t caked with burnt starch and an ironing board that doesn’t look like somebody was body-slammed onto it (even though somebody was probably body-slammed onto it). Now a company has come up with another gadget to make berthing life better: a re-invented rack light. Lighting company Energy Focus removed the fluorescent bulb and replaced it with an LED light. No more flickering or that annoying humming noise fluorescent lights make. It also lasts up to 50,000 hours and consumes way less energy than the old lamps. Toyer said there are about 1,000 of these new rack lamp fixtures in the fleet today, so if you are one of the lucky ones, drop us a line and let us know what you think of it. All in all, it looks like it could be a nifty upgrade for sailors, even if it’s not a luxury item. The smallest items are a luxury while aboard any ship. Besides the essential having an outlet was quite a commodity. Since most sailors like my self have phones they also double as an alarm clock while underway this would be more then a luxury but an essential. Does it also include a security cage to lock up your USB item while it’s charging? Yes, everyone in the fleet should have the integrity not to take anything that doesn’t belong to them, but those who have ever done time on a ship underway knows…expensive personal items grow legs to places they don’t belong. I think it would be a great idea for all the racks to have one. Velcro to the back of your iPhone and the bottom of the rack over you…voila! Instant digital clock/calendar/alarm clock. Master Chief Mulder, I think the charging cycle would occur while the rack was occupied so I doubt a “cage” would be necessary. How do I get one of these for my ship rack? Can I get the NIIN for these? Could you pad the edges? The racks are already so confined that many sailors have sustained injuries from sitting up too fast. I was once laying in bed, sneezed, and hit my head so hard I cut my forehead open.